This car uses a 16-kilowatt hour lithium-ion battery coupled with a 3-cylinder, 1-liter gasoline engine that powers a 53 kW generator.The Volt represents a completely new paradigm: a mass-produced, affordably priced, all-electric sedan sold in the U.S., specifically as a daily driver. If it succeeds, it could lead the way to GM's reinvention as a strong American automaker. 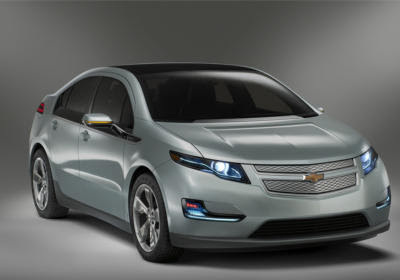 GM execs have said the Volt will go 230 miles on one charge, although the car has yet to get EPA certification. Top speed is 120 mph. Estimated price is $40,000. Chevy execs have said the price will be determined in part by the price of gas. I recently came across your blog and have been reading along. Very Nice blog I have enjoyed reading here and I will keep visiting this blog.